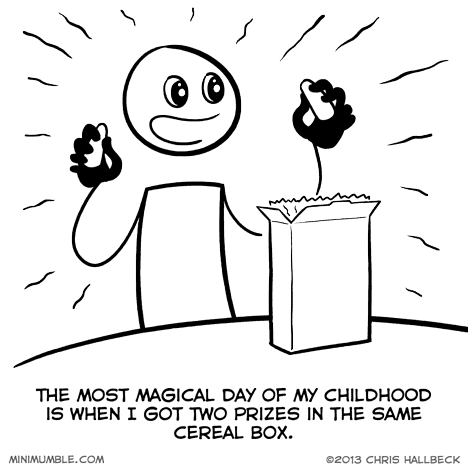 Seems like they only put prizes in cereals like Chocolate-Frosted Sugar Bombs. If they really want kids to eat healthier, they should put the prizes in healthy cereals. That way kids might beg their parents to buy them actual food instead of candy. Then again, if I were a kid, I would beg my parents to get the cereal, dig out the prize, and let the rest of the box go stale in the pantry. So there’s that. Seven dollars for a tiny box of cinnamon toast crunch vs. like five or six for a huge double box of corn flakes or shreddies or something!? ROBBERY. What was the oddest prizes you remember? I’m old enough to have cut records off the back of cereal boxes, assembling tiny terrariums, and getting those fuzzy stickers that changed color when the weather changed. You don’t get cool stuff like that too often anymore. The last good thing I got with breakfast was a Barney Miller DVD. Don’t recall much in the way of cereal prizes being any good, but I do recall getting a nice plastic figuring of Hades in a happy meal. The Hercules movie had just come out, and I got hades. My dad, brother and I were on our way to go camping at the time, so we put Hades on the grill above the campfire ring, and watched him slowly melt, drip down, and eventually catch fire! No wonder you don’t remember any good cereal prizes, you’re clearly much too young. As I recall, they started really going downhill sometime around 1980. Ditto for Crackerjacks. I remember a short spoon made of color-changing plastic. Forgot what little else there was, too trivial.